It is common to see strollers go up on escalators, but the Building and Construction Authority (BCA) wants such sights to go down in number. There have been eight reported escalator incidents caused by the use of strollers since the start of last year, but no major injuries were reported, the BCA said yesterday. It said that more than 92 per cent of escalator incidents are caused by unsafe behaviour, with the remaining cases the result of mechanical problems such as faulty handrails. As part of an ongoing effort to curb errant behaviour on escalators, the BCA will encourage escalator operators to put up new posters and stickers on escalator safety, with a focus on the use of strollers and bulky items on escalators. 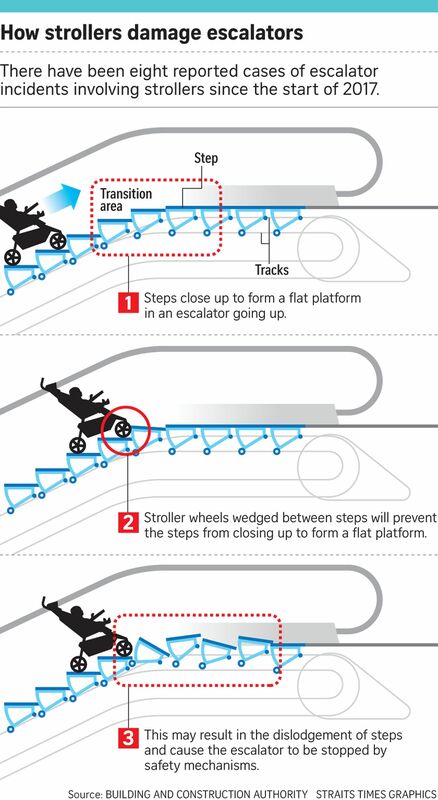 Wheels on strollers can jam escalator steps, causing the steps to be dislodged and the escalator to come to a sudden stop as safety mechanisms kick in. Mr Teo Orh Hai, group director of electrical and mechanical engineering at BCA, said this also endangers other users, as the sudden stop and dislodged steps can cause falls. But not all users may be on board. Designer Johan Hamzah, 45, who uses a stroller for his three-year-old daughter, said: "I may just ignore the signs. Have you seen the lifts (at shopping malls)? Sometimes it's just impossible to get into them." There have been more than 700 escalator incidents reported since the start of last year - an average of about one a day. There are more than 6,600 escalators in Singapore. Incidents reported to the BCA are those involving injuries or the malfunction of critical safety components. For example, in March this year at Bugis Junction, a woman's arm was trapped in a gap between a wall and an escalator, and passers-by had to smash the glass portion of the escalator railing to free her. Other unsafe behaviour on escalators includes not holding the handrail and not standing within the yellow lines. Escalators are required to be maintained at least once a month, and operating permits need to be displayed, in the light of new measures in recent years. Escalators have to be maintained in line with certain key outcomes. The BCA yesterday also announced the addition of one more escalator maintenance outcome to the existing 10. From early next year, escalator service contractors must ensure the controller and electrical system - the "brain" of the machinery - are free of defects, and are earthed and grounded. Engineer S. Yogeeswaran, a member of the mechanical and electrical engineering technical committee of The Institution of Engineers, Singapore, is supportive of public education campaigns for escalator use. "A lot of the time, people don't realise escalators are machines and when using them, they need to stick to necessary precautions."